The main purpose of our playground mats is to keep your playground surfacing safe. Have you ever been to a playground and seen the huge divots under the swing set? Not only is it unsightly, but it is also unsafe. With the use of our rubber playground mats, you can prevent this from happening. These rubber play mats help to ensure your playground looks great and is safe, while children of all ages are at play. 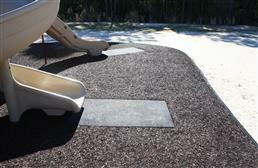 Our playground matting is great as slide mats, which help to soften your landing when exiting a slide. Not only do these outdoor play mats soften your landing, but they also protect your safety flooring from damage. Remember the days when you would try and swing so hard that you would flip over the swing set? Yeah, that didn’t happen, but you sure did try! So what does that have to do with playground mats? Well, it has nothing directly to do with playground mats other than to set your mind to where these mats are used. 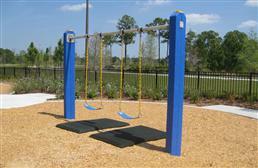 Playground mats are used under swing sets and slides to protect the mulch, gravel or flooring that is under them. Let’s go back to that swing set again for a second. Do you remember what was under that swing set? More than likely there was nothing other than a huge divot in the ground. This is what typically happens under swing sets due to the dragging of feet over the ground. So whatever the surface, you will see this same divot. Playground mats help to protect against this, ensuring your playground looks great all the time. 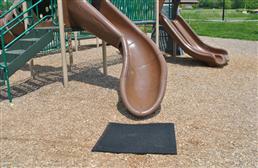 Our swing and slide rubber mats are available in several sizes and colors, and in many different thicknesses. These mats are heavy, high quality, outdoor rubber mats that will take the abuse that comes with being under playground equipment. Plus, the weight helps to keep people from stealing them. And ain’t nobody got time for that! Playground mats are not just made to protect your playground flooring, but people as well. Our slide and swing mats are great under slides helping children of all ages exit slides safely. Some of our playground mats are fall height rated, which ensures that someone will not be severely hurt themselves when falling from a certain height. 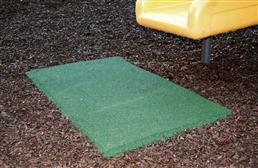 Our playground rubber mats are very easy to clean and maintain with the use of a broom or hose.